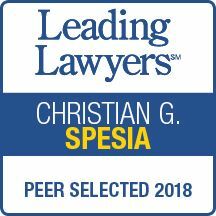 Chris Spesia has been a partner with Spesia & Taylor since 2001 and focuses his practice on municipal law, real estate, land use and development with a focus on industrial, pipeline and utility related projects, litigation, and estate planning. Chris Spesia is “AV” rated by Martindale Hubbell. Chris Spesia’s litigation background includes most kinds of civil cases, including zoning, mandamus and eminent domain and Estate litigation. His recent cases include the successful prosecution of a multi-million dollar oral contract to create a will claim in both the circuit and appellate courts. Chris Spesia acts as the Village Attorney for the Villages of New Lenox, Minooka and Rockdale and as the City Attorney for Crest Hill and assists with the representation of the Villages of Manhattan, Bradley and Grant Park. As a municipal attorney, Chris Spesia has been involved in the annexation, rezoning and development of thousands of acres for the Firm’s rapidly-growing Villages and has established Tax Increment Financing, Special Service Areas and Business Development Districts for the benefit of residential, industrial and commercial projects. Chris Spesia has utilized his litigation, land use and real estate experience to assist the Firm’s pipeline and public utility clients in obtaining government approvals and necessary rights-of-way for new projects involving water towers, water lines, sewage treatment plant expansions, natural gas facilities and crude oil pipelines. Chris Spesia has represented the Firm’s public utility client in land use and construction disputes with municipalities and in the Illinois Commerce Commission, including multiple acquisition transactions and defense of customer complaints. Chris Spesia has also worked on closing the purchase of sewer and water systems from public and private entities and recently handled the purchase of a water system serving 44,000 residents. Chris Spesia works with the Firm’s Estate Planning group on crafting plans that achieve the objectives of its clients, including Estate Tax and probate avoidance. Chris Spesia also serves as a Trustee for Firm clients. Represented multiple pipeline companies in the successful negotiation and acquisition of right-of-way across the State of Illinois. Establishment of Special Service Area and Business Development District and worked on Development Agreements that facilitated the construction of Silver Cross Hospital, the adjacent medical campus and surrounding commercial areas. Annexation of approximately 900 acres of industrial property under a favorable annexation agreement to preclude forcible annexation of power plant by an adjacent municipality. Defended injunction proceeding involving the rights of a real estate developer to capacity in a municipally-owned sewage treatment plant. Litigated and negotiated resolution of contractual dispute between a municipality and an Illinois Public Utility. Represented an Illinois Public Utility before the Illinois Commerce Commission (“ICC”) in defense of formal customer complaints and in proceedings requesting ICC approval of system acquisitions including the acquisition of a water system serving 44,000 residents. Represented pipeline companies in the zoning and permitting of multiple meter stations in Will, Livingston, LaSalle, Bureau and Boone Counties. Negotiated Road Use Agreements with Township Highway Commissioners and resolved multi-million dollar claim for road damage. Obtained zoning approval and negotiated a lease for a crude oil tank facility and barge depot. Represented landowners in multiple 1031 tax-free exchanges. Video Gaming – A Good Gamble for Future Municipal Revenues? When Does Estoppel Apply Against A Public Entity? Can A Bank Foreclose On An Annexation Agreement?